What is a Beach Club? Café del Mar Pattaya offers a premium beach club experience on Thailand’s eastern seaboard, with the iconic entertainments and signature touches that have taken the brand from the Mediterranean island of Ibiza to venues right around the world. It’s all about first-class chillout music, high-quality snacks, outstanding cocktails, the ever-changing beachfront atmosphere, looking good and feeling better. The Original Sunset Session is the highlight of any day at Café del Mar, and it’s the perfect metaphor for a day at a beach club of thiscaliber. Few natural sights are so simple yet so special as a sunset. They happen every day, yet each is unique. Plus they are always better by the sea. Put a great soundtrack in the background and a fire show at the end to light up the night and you’ve got the makings of a great evening. It’s the feat of making the remarkable approachable that makes beach clubs special. It’s a place to go to do nothing but relax and take it easy, which is made possible by the tireless efforts of the club staff. All you have to do is book a seat to be treated like royalty for the day. You’ll get the finest food and drinks brought right to your daybed, great Balearic beats played for your entertainment, a 600-square-meter infinity pool at your disposal and the sun setting into the Gulf of Thailand right in front of you. If you feel like doing anything, you have the option of lying down until the feeling passes. There’s a distinct difference between being relaxed and being lazy, though. You don’t go to a beach club to be slothful and slovenly. Instead, entering Café del Mar Pattaya is like entering a trouble-free zone. Worries and hassles are not welcome because everyone is here to have a good time. It creates a unique atmosphere of fun and friendliness. The beach club experience is not an escape from life. Instead, it’s a place you go to make sure you don’t miss out on life. The good things are amplified and enjoyed while the bad things are left at the door. It’s about making a space to be yourself at your best and to soak up some sun and positivity. As with most things, it’s best shared with good friends, but can be enjoyed alone and there’s always the chance of making new friends at the club. 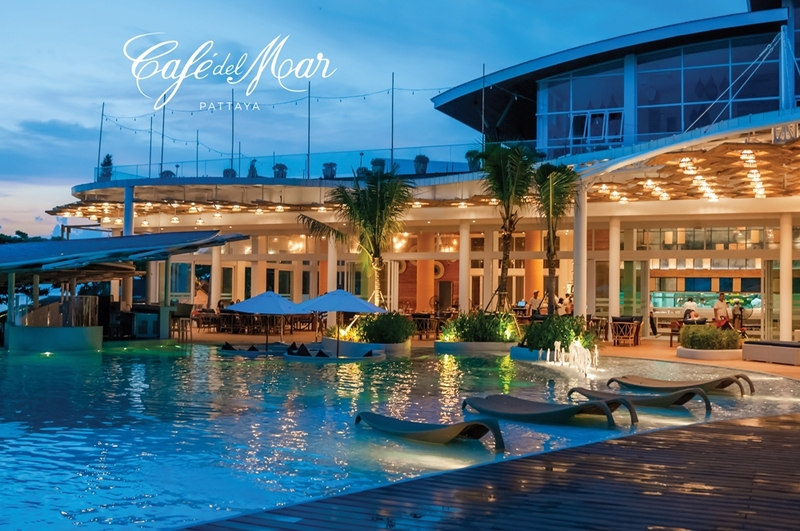 It’s only natural that, once you arrive at Café del Mar Pattaya, you won’t want to leave. Fortunately, the facilities are designed around allowing you to spend the whole day in this unique atmosphere. There are changing rooms, showers, lockers, dining options, entertainment and a vibe that evolves throughout the day, keeping things interesting and exciting well into the night.